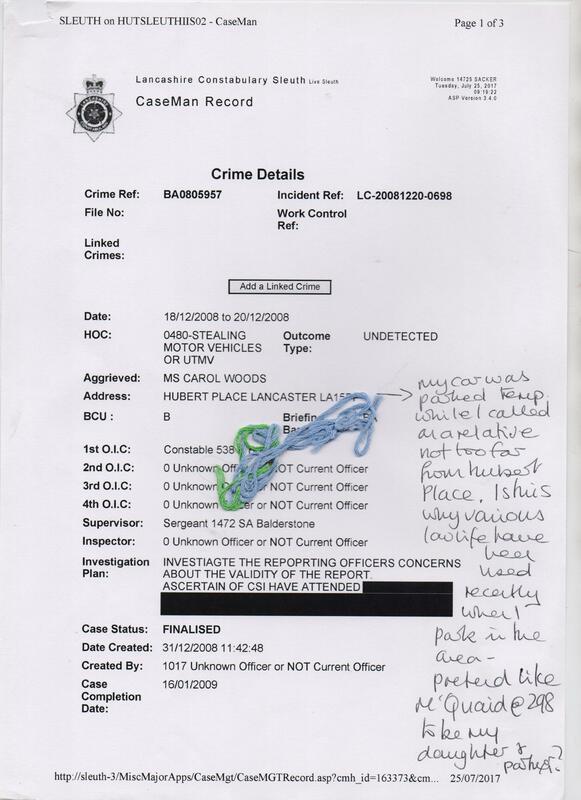 The “Preface” directly below, followed by the most recent updates from 05 – 16 May 18 from Carol Woods which detail the serious crime occurring [all totally ignored by authorities] attempts to form some of the overall background to why Ms. Carol Woods continues to be targeted so badly by numerous Lancashire government agencies – including, it must be emphasised – the Lancashire police force, who have been notified so many times regarding, for example, the serious multi-ID frauds committed using Carol Woods name, in whichever guise or spelling, yet do nothing to sort out the now infinite number of crimes committed along with other serious crimes connected to Carol, including numerous murder attempts on her, which include trying to blow up the caravan she was living in by the culprit creating a gas leak into the caravan from the caravan’s internal gas pipes in an attempt to blow it up – along with Carol. This attempt obviously failed, but other equally serious murder attempts have occurred over the years, including local yobs ramming Carol’s car at speed on a dual carriageway close to Carol’s home. The monetary value of the said ID frauds must run now into hundreds of thousands of GB pounds – all at the UK taxpayers expense. Carol Wood’s ID has been gleaned so many times from, it is very strongly alleged, deliberately misdelivered Royal Mail meant for Carol, misdelivered to criminal neighbours who, amongst other felons involved in the overall targeting, reap the illgotten gains of these fraudulently obtained ID frauds in one form or other – one form being receiving goods, including cars. Cars are driven by local yobs when stalking Carol in her car [which has a GPS tracking device in it placed there by an Oldham garage under instructions from, it is very strongly alleged – Lancs. police. Please see the posts on this tracking device which manages to be exempt from Data Protection Act laws, and also E.C.H.R. 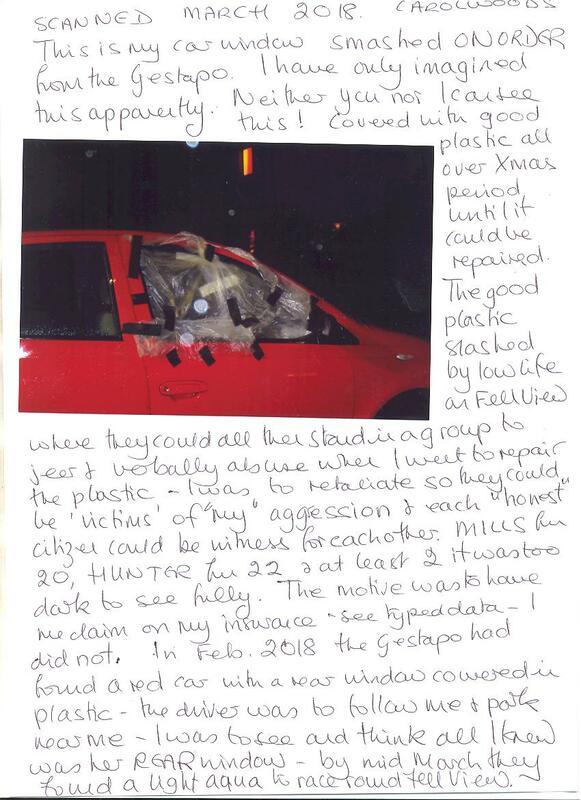 Article 8 rules [the right to a “private and family life, his home and his correspondence”] – how many cars have been “given” to these criminals so as they can harass – and even attempt to kill – Carol when she has been out driving her car? The posts here, copied from Ms. Wood’s communications show the outrageous hostilities happening to her which continue very much to this day – the archive made of scores of posts beginning in Febuary 2016 after certain “supporters” found out Carol had been placed in a closed mental hospital unit for the 5th [at least] time for no honest reason. On January 31st Carol was arrested by Lancs. police for being myself – the owner of this site – for allegedly posting articles here – a nonsense charge easily contradicted by my affadavit / statement as sent to Lancs. police [the statement can be seen in the recent related post put here recently], but nevertheless this unwarranted arrest causing unnecessary hassle and more grief for Carol – the point of the exercise, I for one very strongly allege. Carol has been falsely convicted in the past on most fake of charges. From Ms Carol Woods 28 Fell View LA2 9RP. This data is drawn up from events proven via documentary evidence and shows what corruption and lunacy began much of my case after an “arrest” of 27 Dec 2009 while I Ms Carol Woods stayed with a daughter in Lancaster. I did not live in Lancaster at the time as MY house, stolen, wrecked and looted Oct and Nov 08 was then “occupied” by police officer TRACEY KENNEDY who they used, and use, to be me and she with her partner Anna Judith Pereles who is also used to be me when the corruption suits. Kennedy is also Green Party councillor, self employed and manager of Lancaster Homeless unit, apparently. For the record those 2 lesbians were recruited in 2007 by JANET WOODALL who worked for the Gestapo and was a false friend to me which I did not discover until 2009 not knowing about false friends until then. Woodall was a lesbian and met the 2 via her circles all the time pretending to me she had a relationship with a male. Since I found KENNEDY I also found from Dec 2009 that she had lived with Pereles in hiding in 29 Blades St Lancaster hiding from court debts and debt collectors etc. I found that and the FRAUD using 29 Blades St just before I was arrested on 27/12/09 which arrest I am certain happened because the stalkers had seen me at 29 Blades St with the then new owners, over Xmas 09 and just before. I record the lesbian fact because the Gestapo reverse FACTS in Masonic inversion lunacy so found someone the exact opposite me; thus they had to have a lesbian, never married (to a male) or having had children. I rented in Cumbria at that time. I had also found out and reported that KENNEDY had posed as me on 23 Oct 2008 in LIVERPOOL MAGISTRATES COURT and in NEWCASTLE MAGISTRATES COURT on 27 Nov 2009 and that was for harassment of me of Kennedy who, posing as me meant that I harassed myself. I alerted various about that serious CRIME of gross contempt of court and perjury etc and remain and remained ignored. Thus a WPCSO CHRIS GRIFFITHS called to my daughter’s on 27 Dec 09 and aside from shouting that I had no proof of anything I claimed (how would she know?) she then said a SGT MARTIN would call to help me about MY house theft if I agreed which I did. The Sgt MARTIN 410 was one from Sept 08 who knew about false court documents issued to me and use of thugs as court officials. Thus he was used again as if none of that had happened: the re-use of persons is MO in this. See this last few days and MARTIN again. I was arrested when he called, thus entrapment but for what “crime”? Harassment of Pereles and Kennedy at MY house. How? I had posted a Notice to Quit MY house on the instruction of a judge and apparently, I had sent “emails” and “letters” to Pereles’ place of work disparaging her. The email (ONE) I sent is printed off and kept safe; it was NOT sent, it was returned undelivered as I did not have the right email address. I did not try to resend it. The letter that Sgt Martin showed me was unsigned but I never send unsigned letters. Had anyone complained as I had handed that to the College MY place of work where the UNQUALIFIED INEXPERIENCED Pereles was working as if she was me as well? No one had complained at all, the Gestapo had that copy UNSIGNED because they had ILLEGALLY copied what I printed in the local library which I have caught them doing STILL and copying what I scan. (ALL proof for any jury – E-Crime/Computer Misuse and, waste police time, all criminal offences.) I had to tell Martin as it was unsigned I could not say it was what I had handed in. I was to appear in Lancaster Magistrates Court in 14 Jan 2010 for a hearing and did. Meanwhile I still rented in Cumbria. 14 Jan 2010 and I, with 2 others, waited after asking the clerk about the right court where she said that Carol Woods was in the police station and would be brought over nearer 10am. No, I said, I am Carol Woods; there was some consternation. And then PC J EDMUNDS entered with KENNEDY and saw I was there so they ran away. KENNEDY was to be me again. All this time I have wondered why they thought I would not turn up. Now I know. SEE related attached here. RELEASED NO CHARGE, Date released 28/12/2009 time 00.09. Back in the court, I pleaded Not Guilty and the bench knowing something was amiss gave me a 2 day hearing with CPS claiming they did not know I was not in my house. They tried to force the bench to bail me to my brother’s in Morecambe which the bench refused to do. And, my brother not present could not have had a say in the matter which would have been ludicrous. I returned to Cumbria to await the 2 day hearing which for no reason was moved to Preston. The dates being 17 and 18 March 2010 which were to be the revised version of my first employment tribunal claim which led to much of this corruption, those dates had been 17 March 2003 – 28th and ANOTHER case of mine never entered into public records which was why it was to be “revised” as something very different. WPCSO Griffiths and CPS Griffith were to be Tanya Veronica Griffith barrister, liar, perjurer and worse for LCC in the tribunal I refer to. I was to “forget” her and think of this pair. Events to 17 March 2010 were similar to what goes on now using lowlife and more but I appeared at court with a witness. No trial was listed, my name appeared nowhere, I ran to the Crown Court and staff checked, my case was not there either, back to the Magistrates where I was given permission to leave by the court clerk which complies with the Bail Act. That then led to more than 12 TWELVE wrongful arrests and false imprisonments of me including a spell in STYAL. Apparently I had ‘failed to attend’ but what I had failed to attend had never been stated. There is no such thing as “Fail to attend”. The Met Police arrested me at least 4 times and I was always released even when they dumped me in a mental hospital not knowing what else to do with me. (In that, on one arrest where I “disappeared” and my family rang the station near to where I rented, were told by the very Gestapo that arrested me that the Gestapo had never heard of me.) 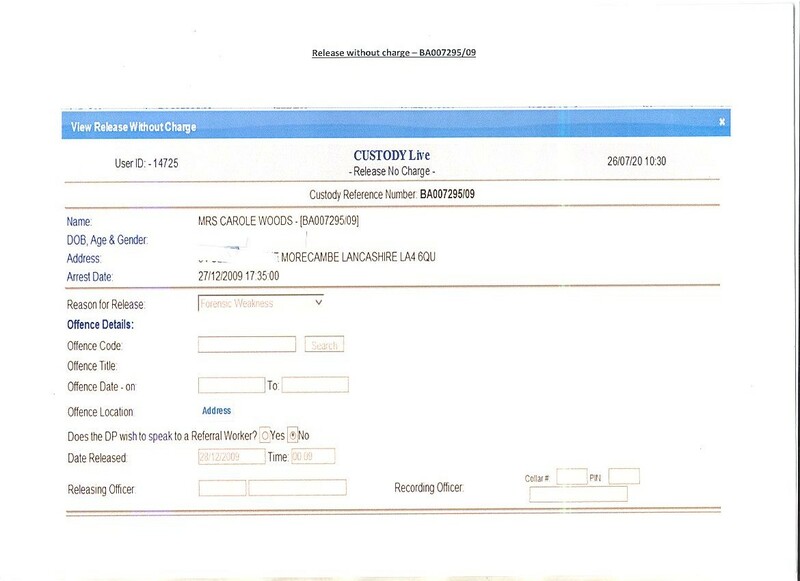 By then I had found out on paperwork that Lancs Gestapo had made me a non-existent person as MRS CAROLE WOODS and SHE was the arrested to appear in Preston – apparently. I wrote to Lancaster Mags Court and told them I seemed to have impersonated a Mrs Carole Woods in error as I had not noticed the slow change of my name and status over time on Gestapo paperwork. Ms had become Mrs, Carol had become Carole and they moved the case to Preston to give ME a Preston link as that non-existent person. The Met police on one arrest had found my driving licence and exclaimed, “But this is you” which was why they could not produce me anywhere so dumped me in a mental hospital. I was NOT the person named by Lancs police for arrest. On 14 Jan 2010 because things had not gone the way ‘they’ planned and the bench had not bailed me to my brother’s, PC J Edmunds arrested me outside the court room on another matter of drivel and police records now show just what that led to as the drivel it had been. The “evidence” of that “crime” was a false court document (which they ignored) sent to someone I did not know existed and the envelope, when I asked to see it, showed a man’s writing. Thus they have tried to invent a MR Carol/Carl Woods since then. The police file obtained after the ICO intervened as they refused me my Sec 7 Subject Access Request under the Data Protection Act 1998, showed what really went on after 27 Dec 2009 and why they assumed I would not turn up so PLANNED to use Kennedy again as me. I attach pages here: THE CASE AGAINST ME WAS NOT ADVANCED; I WAS RELEASED WITHOUT CHARGE. But they refer to my being bailed to my brother’s when I was not. I have informed them, attaching the attached here, that my brother does not know any Mrs Carole Woods nor do I. That he would never have agreed to have anyone bailed to his house at all especially not a stranger. I have covered up some personal detail for privacy. Thus Sgt Martin and the PERJURED STATEMENTS produced for that case when they were the ones used by Kennedy in the FRAUD in Newcastle Mags Court 27 Nov 2009 which I found out about. Sgt Martin perjurer, WPCSO Chris Griffiths perjurer, “witness” Ian Reader perjurer, Ian Young deranged LCC and police legal rep wrote his statement for 27 Nov 09 on 3 Dec 2009 as he is clairvoyant and a seer etc, Kennedy perjurer and Pereles perjurer. Interestingly they claimed to have seen my Notice to Quit from Paris which is something else that no one can claim I have ‘made up’, there it is in black and white. It is how I discovered that Kennedy was a police officer as her statement declares that. I guarantee that those 2 have never been to Paris. How then to revise the Martin name? 2012 and MARTIN BRANKIN fraudster where I then rented at 298 Oxcliffe Rd LA3 3EJ who claimed to be my brother who I drove about as he was disabled; a total stranger and not disabled nor did he live at 298 but the car bought in that fraud was PJ60 BYR a silver grey VW. I then move to Flat 3 Penhale Gardens LA3 2QA and various male lowlife pestered and 3 “regulars” were all called MARTIN. By then I was not surprised. But recently, a campaigner trying to help me was to deal with a Sgt Martin of an address that does not exist in my area, one fabricated to give a link to Blackpool as that is also where I apparently live. Is it the same Martin? JAMES is the name on the campaigner’s document which has the same impact as a lettuce sandwich would have on a foodie. I have checked my documents of 2009 onwards and we have the same SGT MARTIN, 410. This is a classic example of the Gestapo trying to make a male have my experiences to make him into me as Mr. The documents with this also say that on 26/2/10 I was released without being proceeded against. In have no idea what that is. The documents also states that I was released without charge by letter on that date. Where is the letter? Which address did they use? The copy of that letter is not among my Sec 7 SAR file papers. The same document also records that I was bailed on 14 Jan 2010 to appear at Lancaster and released on 26th. That could only be the bogus letter I apparently sent. The record of cells I was held in claims I was moved around with “no reason” recorded. There is mention of the J Edmunds PC 3808 which is odd as he also has another collar number of 975 AND he was not just a PC or sergeant on 14 Jan 2010 he was, as he told me, an Inspector which was confirmed by PC Richard Treddenick when arresting me for sending the false court document to someone I had never heard of. There is also recorded an offence of 9 Jan 2010 but what offence is not recorded and I have no idea what they could even be trying to pretend in that. The original appearance of Sgt Martin 410 was Sept 09 when PC Malone took a statement in regard to PLANNED EXTORTION HOUSE THEFT DEMAND MONEY WITH MENACES ETC; he was her sergeant. There is nothing at all on the file of my Sec 7 SAR data. * The tapes (2 were made) I could only listen to with a relative on his equipment weeks later: IT IS KENNEDY INTERVIEWED AS ME FOR THE NOV 2008 HEARING. Thus her “colleagues” knew she was not me yet interviewed her as if she was me “arrested”. There is more to the question of tapes and how numberings were altered and falsified trying to cover up that major fraud and ID THEFT. Incidentally, on other police documents now kept safe, they record that I reported ID theft and was paranoid and mentally ill. Well they would say that, wouldn’t they? Please feel free to quote me. I have covered up some of my brother’s address, I have emailed the Professional Standards and said as this is not me would they like the documents returning but they ignore me. This data is part of the HSBC FRAUD likely and names AGNES JACKSON thief, fraudster, harasser and more she from 26 Fell View LA2 9RP a deranged parasite who thinks she could be said to be me as others are deluded into thinking the same. Before I record that I record that I drove to CARNFORTH library and found that ONE HOUR of my time had been USED UP to the puzzlement of the librarian and to me. YOU knew I was in Carnforth via the ILLEGAL DEVICE on MY car and I knew as the usual half-witted unemployed start to harass and act out instructions which I mostly ignore. Trying then to copy and paste this to an email I found that MY screen was cleared and it was impossible to do anything; SOMEONE access what I do. This also then to agencies who I wish to inform of E-CRIME CONTINUING. I shady male sent in to use his phone to make TRAVEL arrangements left one minute ago and this screen clears. Jackson is in her 70’s and I suggest has not worked much at all, ever. She is in cahoots mostly with WILLIAMS in 30 Fell View who also claim to be me but as a married pair. Jackson seemed to have 2 sons, both thugs but one only called a few times from my moving into 28 (24/3/14) and he had obviously not called for years if ever. YM55 TGK was used in that and his frauds e.g. running away in April 2014 with a TV they had installed linked to me in 28 so that I would be charged with viewing without a licence. YOUR lunatic in residence claimed MY photo of him running away with the TV when found out was him bringing the set but your lunatic in residence has not seen all the series. The other son, slightly younger had then been sent and clearly he had not been for years and he was long term unemployed. I guess he is in his mid 50’s. He tried to pose as MR Carol Woods to steal my car. I found more illegal activity there which equipment installed for that FRAUD and ID THEFT the Gestapo moved end Aug 2014. The lunacy in harassment and trying to rewrite hat filmed event is noted. Jackson went to a GP on 9/9/14 while PCSO PETER WOOD kept me talking in Fell View so that I could not go out to be seen elsewhere to spoil her fraud. Jackson thought if she wore red she could be me because I have a red car. On 5/6/7 July 2014 she had admitted herself to a local mental hospital claiming to be me when they all knew she was not. Various lowlife have been sent to drive her about to aid and abet her. 31 Fell view and use of BK53 EWE was ONE old doxy used to driver her about as if she was me in a DWP FRAUD. Y191 SLF was another used which was then passed to unemployed idiot male who went about to be Mr Carol Woods using that car as it is red and that was to be PROOF he was me. He was then moved to 15 Artlebeck Road near Fell View. As Jackson was to be me she needed 3 daughters which she does not have so 3 old trolls were sent to be her daughters when they were nearly as old as she is; they called once each for 2 or 3 minutes then never again. Jackson was to be me as a qualified social worker when she is barely literate so she was provided with a council driver to drive Jackson about with sandwiches and pretend she was Meals on Wheels thus me as qualified social worker. That lasted 2 or 3 visits and then the lunacy extended to the unemployed son KENNETH JACKSON calling for a packet of biscuits for his workmates when he had none. Jackson from 36 Fell View was also used despite no relation he claimed to be her son in a DWP fraud where he had to shave his head trying to pretend he was MY son with the right colour hair. 24 Fell View CURWEN fraudsters and thieves also claim they are linked to me for GAIN and 24 while unoccupied was used by various thugs who were chosen as they looked similar to each other and with “auburn hair” also drove Jackson about as her sons to make her me. Younger people were provided to be grandchildren when they were too old and she has none. I have. ALL OF THIS IS ON PHOTOS. By Nov 2017 it was decided that Jackson was herself when out in RED and not me as Mrs C Woods after all and now she pretends that she is me when she is out in the navy she used being herself from March 2014 to Nov 2017. An old woman was sent to be a sister to Jackson as I have a sister: she was no relation at all and stayed 2 minutes and never called again. Jackson is said to have an identical twin to aid and abet her fraud when she has 5 FIVE on photos sent to be that “twin” and they never call more than once either. Lookalikes of Jackson are sent to be where I am as proof she is me, she is about 5’ 1”, dumpy, waddles, has short white hair and is like millions of similar types in their 70’s. Various cars have been sent to drive her about as despite being me, she does not drive. The INTENTION is to claim she is me and “too ill” to drive. Jackson was sent to mess about in a window box on the main road at the pub there so she would be seen and thought of as a “gardener” when her garden shows she is not. The INTENTION was to prove she was me as I am a qualified teacher of “A” level horticulture and have experience in that role. The window box was removed as she ruined it. Cars used by Jackson and ALL in FRAUD. This does not include the cars used from 31 and so forth. 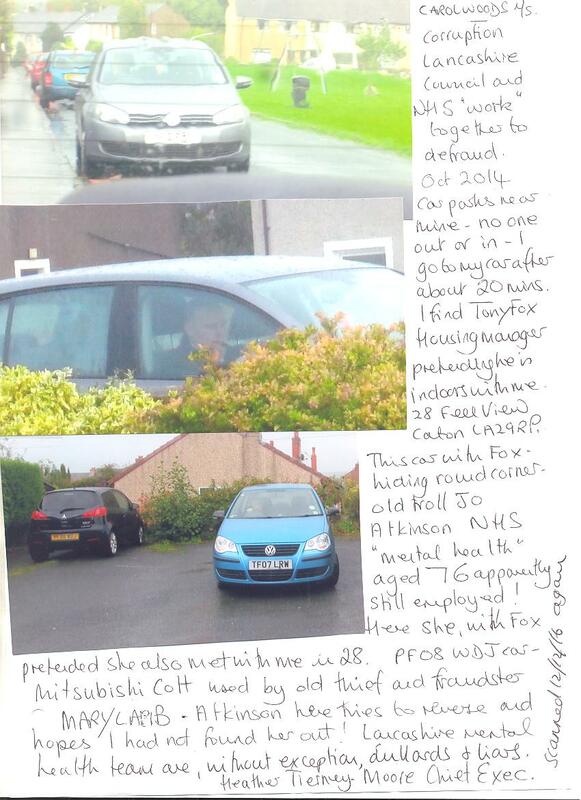 YH13 MXN was the red Vauxhall used to remove the ILLEGAL devices end Aug 2014 by the Gestapo. YM55 TGK I had included above, black Audi. PK63 SFE black Mercedes which replaced YM55, Y807 FHJ black Ford, Y313 YEC black VW, NK06 KXX used by at least 4, HD02 MGO silver Bora used by one “son” introduced to her, PE03 DXS a silver Vauxhall used mostly, P514 JBC light blue BMW, R881 OEO red Ford, YR51 WRE aqua Rover and KS53 VLF red estate used from 24 Fell View. There is much more to Jackson and her frauds but there is enough here for any jury to see what goes on. Dear Bob Gallacher DWP FRAUD DEPT and those sent this. I attach a document which I have folded to show what is necessary as I only want the one page given I attach other pages. This was sent to me via letter from the council 2 weeks ago but only received by me yesterday. 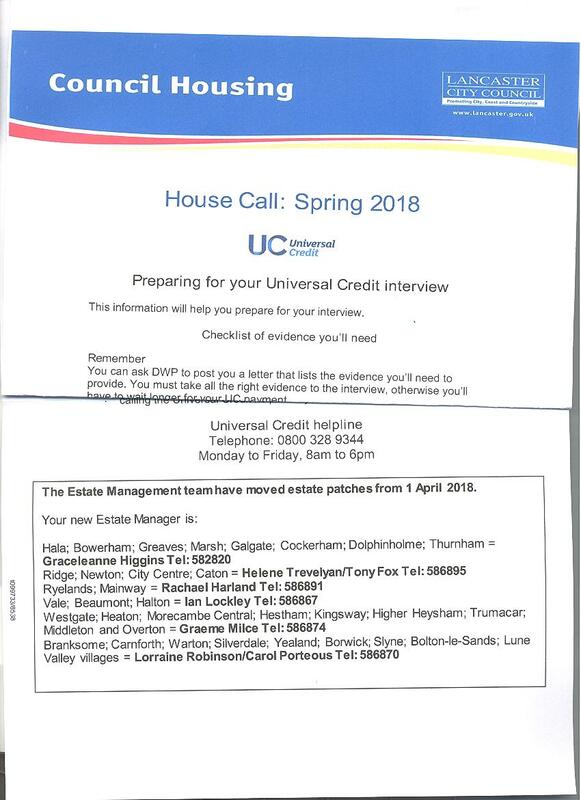 I have no idea what this UNIVERSAL CREDIT is but someone tries to manufacture AS FACT a CLAIM IN FRAUD and suggests to me that this is also ready PAID TO LOWLIFE WHO CLAIM TO BE ME. IS THIS THE HSBC ACCOUNTS IN FRAUD AFTER THE SANTANDER FOUND OUT? The salient points are that along with the detail that those who claim this money which has to be unemployment benefit related, have to state a reason why they cannot work. How can all the lowlife 99% round where I am obliged to “live” not gain work after seeing them swan about for over 4 years and spending obvious high volumes of money. Maybe they will ALL claim they have had a parent die who left them small fortunes, and yes, the moon is made of green cheese. This is what I TOLD THE FRAUD DEPT ABOUT for years. The lowlife ALL claim they are unavailable as they are CARERS and DRIVERS (of me) when they are not. 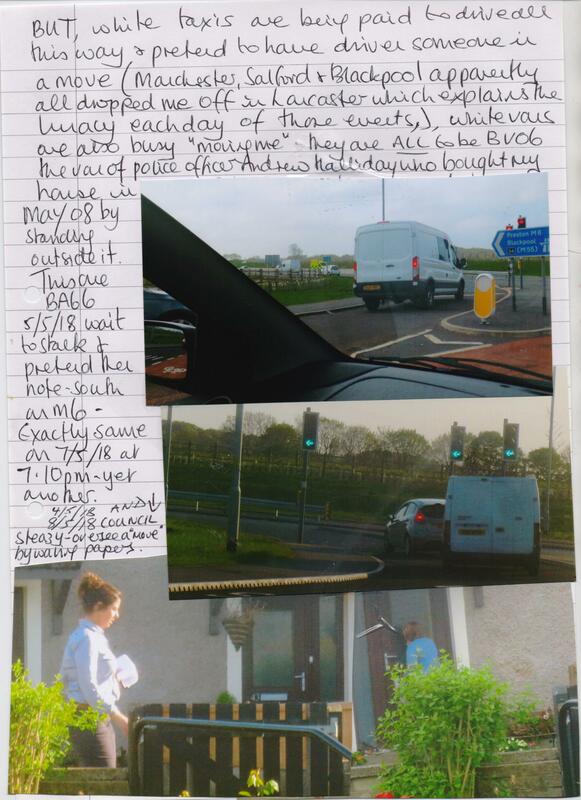 Thus such as yesterday in this lunacy, the Gestapo sent to the child abusers and ruffians in 23 Fell View CLARKE, the van from PRESTON firm of CLARKE (which repairs and deals in wheelchairs) which has been sent on and off from March 2014 to PRETEND that they have someone in a wheelchair they care for and drive about when they have not. The same thugs with the van who often hide NEAR Fell View to pretend and hope I don’t find them but I have enough photos to satisfy any jury.) BUT to aid and abet them and make me think I was wrong the Gestapo provided them with disabled young boys when 23 is not adapted for wheelchair use at all nor were any of their large expensive vehicles provided at tax payers’ expense. ALL on film and full details on request. I have sent out the frauds using 2, 12, 14, 18, 20, 22, 24, 32, 36, 38, 42, 11, 21, 23, 29, 31, 33, 37, 39, 41, 43, 45, 49 Fell View scores of times and related OTHER lowlife used so that they can ALL do nothing but drive about and stalk me when they are told to and pretend they drive me. They do NOT include such as Williams in 30 and Jackson in 26 and O’CONNER in 39 who all claim to be me. Can I add that the lunatics pretend I just moved in again today, the van BA66 NWC from, I guess, BLACKPOOL was used in that plus the usual Gestapo thugs. Last evening after they had lowlife pelt my car with eggs and all the usual they had the usual type of halfwit where I was socially and she was to be SEEN and thus me as I was not expected to make it back to Fell View. The PLAN AGAIN: the Gestapo park on my route back WITH THE ILLEGAL GPS ALLOWING FOR ALL THIS, to alert another thug on the edge of Caton to race to meet my car approaching and try to run me off the road AGAIN. He failed, they would have claimed that the Gestapo saw me driving too fast, the local lunatic where I was socially would be said to have been seen DRINKING as me, but the halfwit they had used who was to be seen drinking was not me, I do not drink at all so now we have that on record. JACKSON in 26 Fell View who claims to be me (in the TREASON again today) and WILLIAMS in 30 are both drinkers but, they are not me whatever their lunacy leads them to think. The other section I wished to scan to send is the FACT that IAN LOCKLEY is named as staff HOUSING as is HELENE TREVELYAN and TONY FOX. 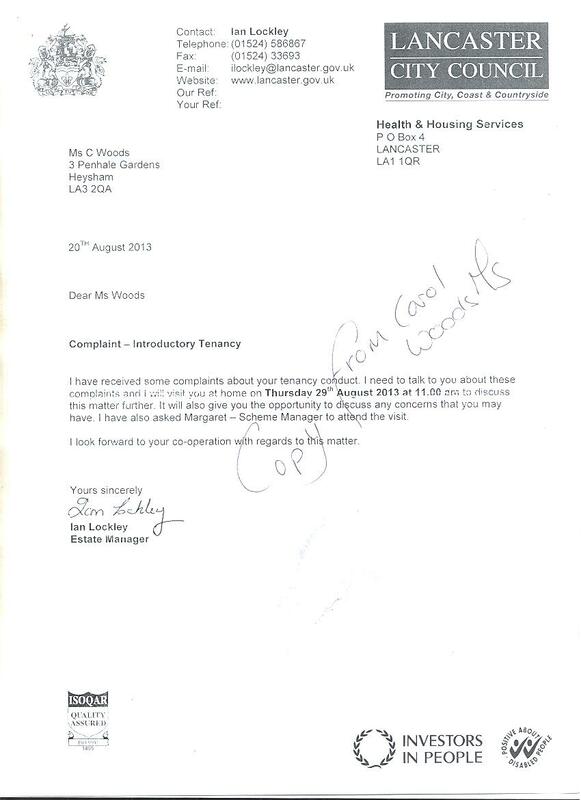 I attach the letter Lockley sent to me Aug 2013 to keep me indoors while he with other council sleazy and local corrupt solicitors hid in flat 4 above me and pretended that SHIRLEY RYCROFT murderous thief was me and she was selling MY house claiming to be me “too disabled to live in it”. 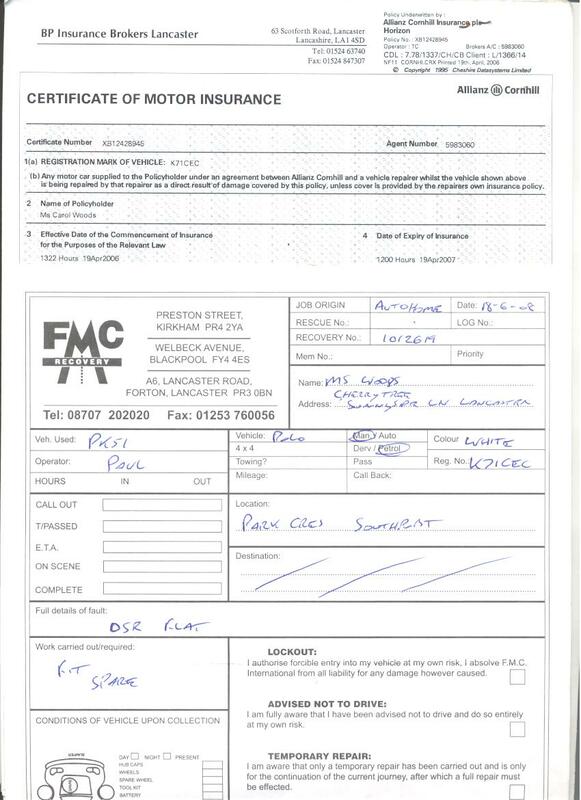 Lockley reported to SFO as more than £500.000.00 was involved; that was ignored and he is STILL employed so, this can be used in my claim. I left Penhale Gardens 24/3/14 for 28 Fell View and thus enter Fox and Trevelyn. Fox I add on photos, he found hiding in his car Oct 2014 pretending he was indoors with me and the sleazy former NHS liar who hid in her car which I found also parked in hiding. She was pretending with FOX to be indoors with me to pretend they were concerned about my mental health. What moron agrees to hide in a car and pretend? A mentally ill one. FOX still employed I see. Helene was one who called days later with the same sleazy 76 year old from NHS and an 80 year old posing as psychiatrist which went on to become as FACT that a psychiatrist had called to see me and was sure I was mentally ill. The psychiatrist in that as NAMED and PRESENTED to as being to me was a Linda Ashworth who confirmed to me and a REAL psychiatrist that the 2 page letter that CQC gained for me when I told them I had been told there was one after that visit but no one would allow me a copy, that Ms Ashworth had never seen me, heard of me, met me and she had not written any letter at all. My Misconduct in Public Office reports were ignored. Now we have this with the lunatics showing me how the lowlife have managed to OBTAIN MONIES BY DECEPTION IN MY NAME. Thus I also send to Gestapo and they can busily ignore it. Ends Carol Woods Public Interest, anyone can quote me. Dear Sirs Please ensure that this is at least seen by Mr Stephen Gearing. The attached is a letter that a campaigner received as he campaigns in regard to my case of police thuggery and much worse (as he works on other cases as well). 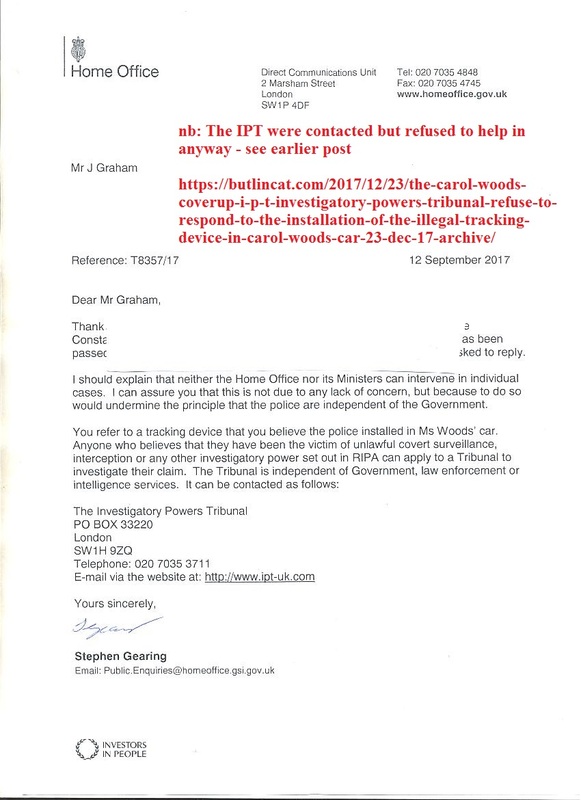 The person is Mr J Graham and the letter is 12/9/17 which he sent to me to show me what response he had received from the Home Office. I have to say it is more than I receive and it is MY case! I note it is stated that police are not involved in politics so the HO gov led cannot get involved in individual cases (they did in the case of Stephen Lawrence) but let me say that YOUR POLICE STAFF in a TRACEY KENNEDY who claims to be ME in MY house (my house stolen wrecked and looted Oct 08 and Nov 08) and who is used to appear IN COURTS as me (please ask for FULL details and what statement I would make with proof), she in a PERJURED WITNESS STATEMENT states she is police officer which is in black and white and signed by her to be FACT. BUT she is also a GREEN PARTY COUNCILLOR which is also PROVEN and she runs her own business (alternative practitioner which needs no real qualifications) and according to POLICE LEGAL REP IAN YOUNG she is also a “council staff member” and manager of Lancaster Homeless Unit. I KNOW that courts and debt agencies have sought her for years which is why she claims to be me. SO here we have it , POLICE INVOLVED IN POLITICS all on formal documents which a jury should see. Dear Sirs I have a “prediction” as to Lancs Gestapo AGAIN right NOW manufacturing “evidence” and a “victim” to CRIME said to be committed by me. THE CORRUPTION WITH POLICE AND COUNCIL IS STAGGERING. I left 28 Fell View about 45 minutes ago and drove to Morecambe library to use the computers as I do not have my own which most know and despite the unemployed lowlife all using social media as if it is MY use, the Gestapo continue to PRETEND it is MY use when they know it cannot be. This is from Ms Carol Woods at 28 Fell View LA2 9RP. Leaving, I found that the Gestapo were at 20 Fell View with K MILLS who they gave an alias to in 2017 to aid and abet her serious crimes. ALL reported, ALL ignored. The alias is STAIG. They have previously called socially to Mills especially AFTER they dumped the squalid caravan on her frontage (as per the photo sent out this week) and then aided her to claim I was her aunt and rented that from her with her added bonus of deliveries in FRAUD as if I placed the orders AND claiming RENT as if from me. Mills was a stalker OFTEN and would often be told I was at Lancaster University for example (with the ILLEGAL GPS on MY car allowing for this) so she could drive all that way to then STALK ME all the way back to Fell View and PRETEND she was driving me. She unemployed has a huge, expensive vehicle and someone pays for that usage. Previously the Gestapo has been at 20 in unmarked car and I found it was Gestapo as it was then used to try and trap me to say I was driving more than 20mph in a 20mph zone when I was not. Thus MILLS reported again recently for constantly trying to provoke me by shouting at me and ALWAYS with the “convenient witness” about to claim that what I shouted in reply was “anti-social” when I ignore her. Thus I send out a photo of her MID FRAUD of 2015 (as confirmed by DPD which driver was involved) and they will scream I harass her! The photo shows the caravan at 20 where I apparently lived as her aunt. In that JUNE F WILLIAMS with Mr K WILLIAMS in 30 FELL VIEW aka Mr Carl Woods and Mrs Carol Woods (ID supplied by the Gestapo to aid that FRAUD and ID THEFT etc) claimed to be MOTHER and FATHER of MILLS (and her sister also K Mills) and in that, which took me a few months to find out, Williams as ME WOODS claimed that they were me and I was sister to WILLIAMS thus aunt to MILLS. Since I found that out in 2014, summer, MILLS have not so much have said ‘HELLO’ to Williams. Thus today, the plan is for tomorrow the 11th as the 31 Jan 2018 failed so dismally and they refuse me my custody records and CD made of the interview. Instead of calling to arrest me (and steal my lap top which also went horribly wrong for them) for harassing Williams aka WOODS as they did on 31 Jan 2018 with Travis Dalton from 45 hiding in the police station claiming to be MY son as if his mother in 45 is ME (more fraud), they opt for 11th as that could be “mistaken” for 31st, thus Jan 2018 is May 2018. Recently I reported MILLS for harassment and use of loud foul mouth troll who in NY54 RZN used 20 Fell View and the sister’s round the corner to scream foul language into her phone while racing round and round Fell View and pretending IT WAS MY USE. That HARASSMENT of me started 22 12 17 and went on until LAST WEEK at least 4 times EVERY DAY. I took a photo of the Gestapo at 20 today, they had been there a LONG TIME and were still settled in as I drove off from 28. In that they have called socially to DALTON in 45 Fell View to aid and abet them as well but then they called in the very early hours of the mornings hoping I would not know. WILLIAMS as ME then have their 5th FIFTH CAR in FRAUD PJ65 WLL a dark grey Peugeot but their cars are as if they are me. Over the weekend they have had a vehicle left in a space allotted to me which vehicle was a total stranger sent to aid and abet DALTON in 45 to have her driven about to be me as she does not drive. He left this morning in this PLAN. Williams were to park PJ65 WLL in MY space and PRETEND that was PROOF then that the vehicle in MINE with mine being invisible apparently and RED, which the Gestapo want to claim is AGNES JACKSON’s in 26 Fell View another they aid and abet in serious crime as she also claims to be me as her identical twin. The space for WILLIAMS is taken by a black Hyundai PK56 ZTY, one to stalk me OFTEN but not seen for a while so obviously instructed to call and leave in the space at 30 as if it is WILLIAMS’s car and PJ65 WLL then pushed onto the space allotted to 28 (mine) seems that PJ65 WLL is WOODS. Williams I sent out the photos showing how the Gestapo aid and abet them yesterday in the lunacy of SHED THEFT etc. This is the reprisal for sending out what I did. The YOBS at least 2 sent to use social media in the library only used their library computers after watching for me to log on and then off. Today walking to the library I have a yob parked blocking an entire street he lying across his front seats which I saw as I crossed to see why the car was left seemingly unattended in the middle of the road, AG53 CAL a black FORD he was not “alone”, a pair of trolls who could not stop gawping so obviously sent to use their phones as I drew near and passed were also parked illegally on double lines, PN15 PPO a dark grey Citroen. MILLS, I ADD, PARTY TO ARREST OF NOV 2015 OF ME AND PERJURY CLAIMING I TOOK PHOTOS OF HER CHILDREN WHEN I WOULD NOT KNOW HER CHILDREN (OR CHILD, I HAVE NO IDEA) IF I FELL OVER ONE. LIAR SHE IS THAT WAS PRODUCED AS EVIDENCE AGAINST ME REPORTED AS PERJURY, IGNORED YET THERE THEY ARE CALLING SOCIALLY YET AGAIN. Mills of course is always available as she is unemployed and misses her “free money”. DWP alerted, council tax and all such bodies who should have wanted to know but silly me, it was ALL ORGANISED ready for my moving in. MILLS uses her phone and lap top as if it is MY use in E-CRIME. THIS IS INTENDED AGAIN TO HOPE NHS CLAIM I AM MENTALLY ILL WHICH THEY FAILED TO DO ON 31 JAN 2018. Please pass this round. Ends Carol Woods Ms. The legal definition of a COVER UP. CC to those who might find it useful. This category provides that qualifying disclosures include information not only about the substantive malpractice, but information which tends to show the deliberate concealment of information about the malpractice. Dear Sirs I Ms Carol Woods do not access this email address often and found DALTON in 45 FELL VIEW LA2 9RP using it as theirs from 2014 which I only found out about in 2015 by chance.Of course the reprisals followed to make that unemployed lowlife the “victims” of CRIME MY crime! Apparently I followed them to Manchester airport as a stalker on 5 Oct 2015 while they went to Tenerife without passports, flights, photos or even knowing where Tenerife was BUT the Gestapo had MY car plates on CCTV apparently at Manchester but not until July 2016 when I was there for my Italy trip. 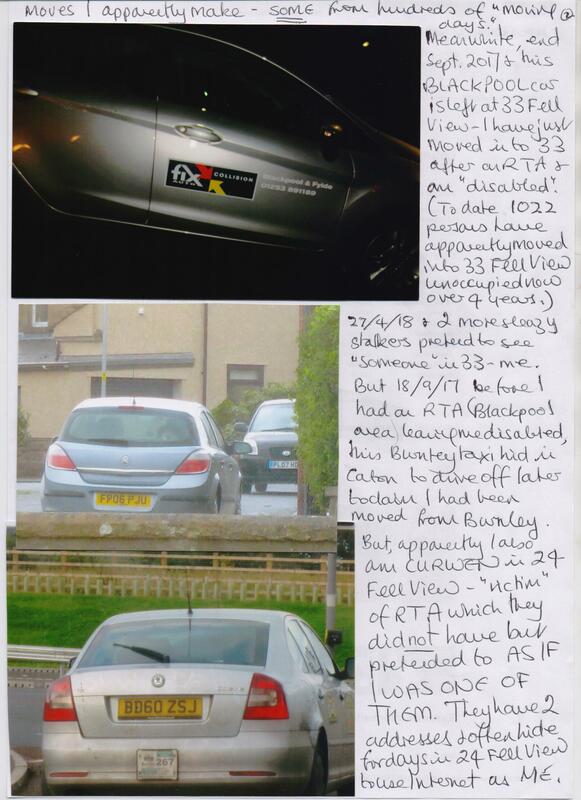 On 5 Oct 2015 I was in Barcelona and my car was in Liverpool airport car park but heck, that is not PROOF apparently, no, DALTON unemployed lowlife had an unemployed “witness” to confirm he saw me on Fell View between 5 and 10 Oct 2015 so, PROOF I had stalked them! I have sent out today (not long ago) from my other most used email address woodsresearch2002@yahoo.co.uk relating to others what the Gestapo PLAN for 11th using AGAIN unemployed lowlife to be “victims” of “crime” they invent I commit. In that other thieves and fraudsters were all used playing their roles in lunacy. This is ANOTHER “FOLLOW TO A LOCAL AIRPORT” type of crime. While I recorded that the Gestapo called to thieves and worse (PERJURER as well) K MILLS in 20 Fell View to make her a “victim” of CRIME in masonic inversion of lunacy when she is the criminal spending a deal of time AGAIN they did not call to me to ask about MY CAR WINDOW SMASHED TO ORDER OR THE RELATED HARASSMENT USING MILLS AND OTHERS IN THAT, they did not call about my car pelted with eggs TO ORDER this week but they can spend time with a thief and fraudster who they gave a “new name to” STAIG to help her avoid charges of FRAUD FOUND OUT. ATLAS REMOVALS LOOTERS of MY HOUSE (the reprisal today is because of what I sent out yesterday) and they sent often to harass me and PRETEND I only know them as moving me! I have many photos and add just enough to show what lunatics I deal with. 25/10/14 morning I “move” to Fell View after I had moved on 24/3/14. I do not go out so they wait a few hours (YOU FUND THIS) and drive off. They return after a couple of hours and move me some more; I still don’t go out. On the day I did move, I had to go out to find a phone to get a plumber to call to fix my cooker which was what they wanted to claim AGAIN but I did not go out: I had not just moved again. The replacement thugs via BLACKPOOL thugs in this ATLAS firm STALKERS who pester me and pretend they drive me about. I found the firm name on a van and checked them on the Internet finding they were a BLACKPOOL FIRM of NHS. Reported to their Head office who confirmed they indulged IN CRIMINAL ACTS OF HARASSMENT, NOTHING WAS DONE. This is partly to claim I am from Blackpool in yet MORE lunacy to hide PERJURY and WORSE of Nov 2015. FP06 PJU is sleazy council who PRETENDS she moves a Mrs Invisible about and to 37 or 39 as well as 33 and they are all me. “I” moved again today to 37 in the “plan” to “see me off” using the thieves and fraudsters in 30 and 20 Fell View esp. I also “live” in 37 (according to the lunatics) after an RTA left me needing 24 hour care by the most amazing specimens of “humanity” one would not trust with a dead rat. I have never had an RTA despite ALL attempts to run me off the road such as Friday night last etc. BUT I am also CURWEN in 24 Fell View with their FRAUD of claiming I am there and took £50k with me to give to them! Yes £50 fifty thousand pounds sterling. Why Burnley is used I have only a vague notion but this taxi hiding in Caton on 18/9/17 (before I was driven from Blackpool!) was pretending he had just driven me from Burnley to move in. THERE HAS TO BE TENANCY AGREEMENTS FOR EVERY MOVE SO NOW THERE WILL BE AT LEAST 1000 SUCH DOCUMENTS SIGNED BY ME UNLESS I HAVE UNCOVERED MORE EMBEZZLEMENT OF PUBLIC FUNDS AND HAVE NOT MOVED ALL THOSE TIMES. On 22/2/18 a taxi from Salford moved me from there to Lancaster and apparently dropped me off in the town centre YG14 badge 3221. This is ANOTHER BEHIND MY BACK FRAUD, I am not to find out what they arrange to then claim is FACT. BUT 24/4/18 and I move from Manchester again dropped off in Lancaster (all photos taken from inside my car which raises questions) YH67 SKX badge 1873. Meanwhile I have apparently made up the FACT that the Gestapo organised lowlife to smash my car window and really all I know is this lowlife sent for WEEKS to pretend at 13 Fell View with NO rear window and ILLEGALLY racing round to be MY car events of Xmas 2017. My car is just seen at my gate. Red Toyota Yaris which the Gestapo now want to claim is AGNES JACKSON’s again she in 26 Fell View a thief and fraudster who claims to be me with TREASON INCLUDED. That is not a crime apparently so they ignore all that and invent something that they think might be seen as crime but committed by me. Then after a supporter received an item of junk from BLACKPOOL address of Lancaster police of which there is no such thing ( a Sgt JAMES MARTIN) the Gestapo decided BLACKPOOL had to enter the frame again and this taxi DT66 HWP was sent all the way to Lancaster to then drive through and to the M6 south to return to Blackpool and PRETEND he had dropped off “someone” – me again! BLACKPOOL is because I apparently stalked DALTON to a “local airport” when we do not have one but a LYNNE AUSTIN of Blackpool has that one so, she became me thus she is moved from Blackpool apparently and she is me in 33 Fell View and 37 and 24 after an RTA which would not be surprising as Mrs Austin does not drive and never has. I just wonder how she got to Fell View to then stalk Dalton to their imaginary holiday.Or did they live in Blackpool so she could stalk them from there? That is not all: BA66 van hides to then stalk me as he has moved he and he returns “south” as if I was from south somewhere on 5/5/18. Then again 7/5/18 and not the same van but this type is used often and he has hidden to stalk and pretend. The white vans are from police officer ANDREW HALLIDAY at MY house May 2008 where he apparently bought MY HOUSE by parking the van outside. Then amid that I always have the sleazy and gormless from the council with one doing what I have others doing on photos: that is walking up and down outside me and waving keys and papers and pretending it is a NEW MOVE. BUT on 8/5/18 this one arrives in LT59 FGN a stalker of YEARS now and council who is on film stalking me along the motorway when I went to a music festival in 2016. WHO PAYS FOR ALL THIS? YOU DO. 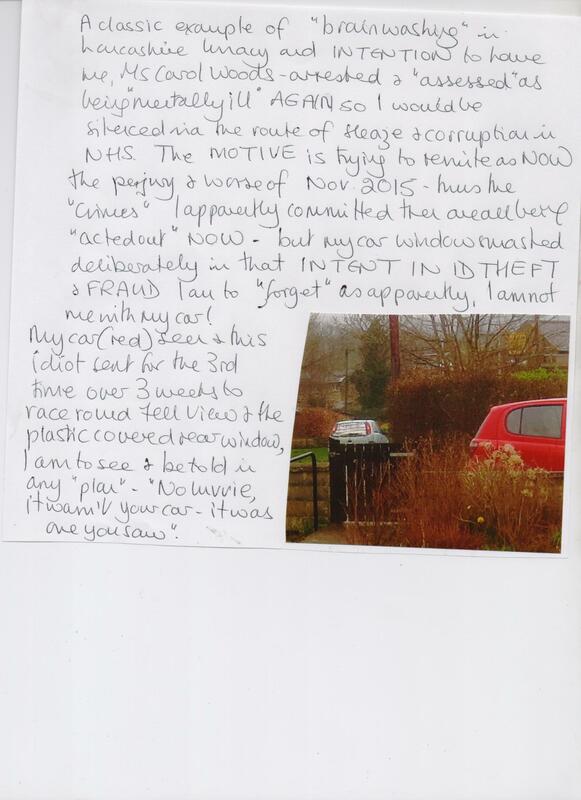 This one is ONE from at least 4 drivers of that car and they ALL use 41 Fell View as I also live there not only cared for and driven about by JARVIS but SUZANNE JARVIS is also apparently me. This time, this one waved the usual papers, walked into 41 and then left fast as she saw I had seen that repeat FRAUD to aid and abet a known fraudster. Ends Carol Woods. to andy.rhodes, politics.editor, policing.minis., me, bae146, secofstate, customerinvest., graham.farrant, helen.reynolds, johnsonb, john.humphrys, look.north, privateoffice, homeaffcom, dispatches, ministers, contact, richard.littel., sajid.javid.mp, farront, telegraphedito. This is where lunacy in Lancs is “revised” and rewritten as more lunacy. From Ms Carol Woods under duress at 28 Fell View LA2 9RP. Over the week to 11 May 2018 and then onto 14th May 2018 which dates were to be 11 and 12 Aug 2012 AND 14 Jan 2010, the Gestapo wasted YOUR money in arranging lunatics and lowlife to stalk and harass and try to make events of those times NOW as if it was something different. This is to muddy waters of investigation. Please feel free to quote me. Thus this car HAS to be ‘covered for’ BUT then I had gone to rent Flat 3 Penhale Gardens by 1/7/13 and find much more in FRAUD and worse. 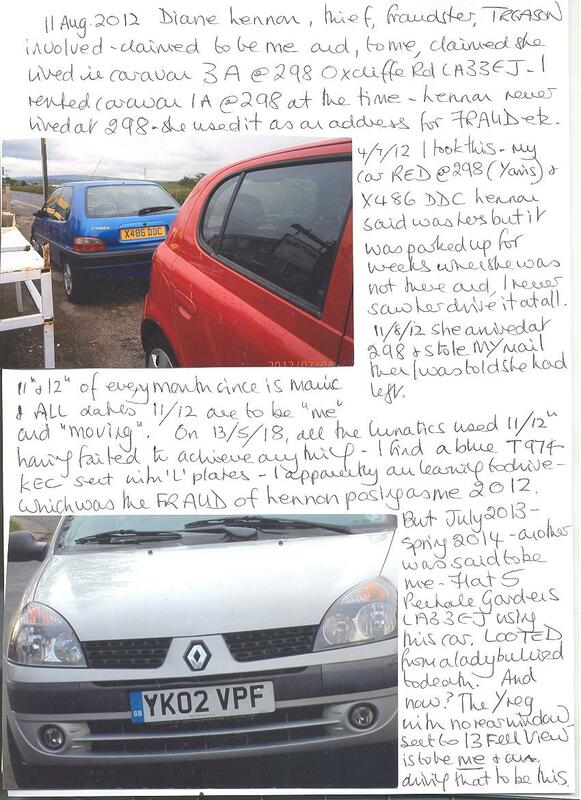 This car YK02 VPF was LOOTED from a lady bullied to death in Flat 3 prior to my moving in. She was said to have been my mother (making me yet someone else) and the car was for me. BUT a seedy old parasite and thief, looter of the dead in Flat 5 had this car with a provisional licence provided by the Gestapo IN MY NAME: she was the “me” when I left 298 as Lennon had been the “me” from March 2012 to found out Aug 2012. The lady in 28 Fell Viewhad been bullied out and ultimately to death when the Gestapo decided it would be “useful” for me given they had ready recruits in unemployed thieves round Fell View waiting to take part. They thought I would not find out! How then to mix all that up and make it NOW? One example is police thuggery and I took a photo not an hour ago of a MALE stalking me and trying to park with me, he in a red Yaris (mine thus is invisible and I am male apparently) the ILLEGAL GPS on my car allows for all this. 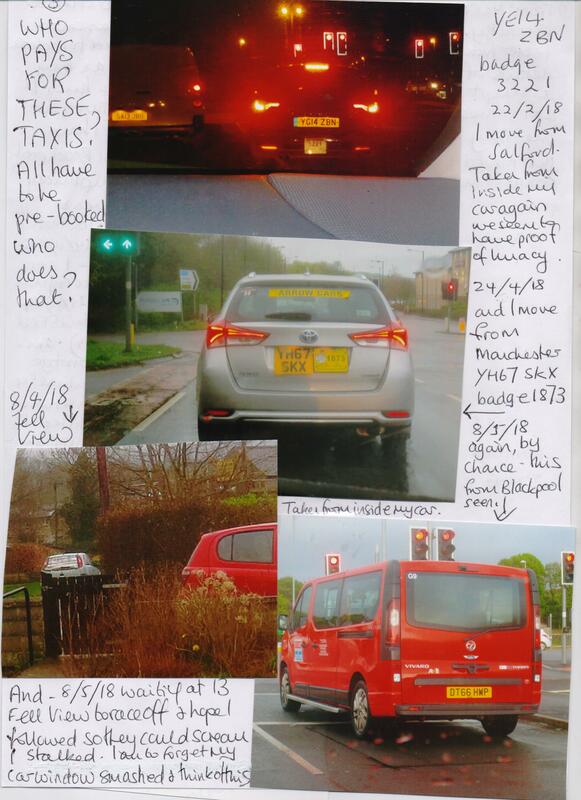 The Gestapo cruised round (more than 5 squad vehicles used yesterday Sunday in similar thuggery which are all on camera) with a BLUE YARIS and grossly overweight driver female PX14 and they would claim she was me “seen in a blue Yaris” which PX14 does not seem to be easy to mistake with X486 and a Citroen anyway. The grossly overweight trolls used are ALL me and they are me as “obese” thus “disabled”. There was much more which I do not add here. The attached shows also MY car window smashed to ORDER with the INTENTION of forcing me to claim on my insurance so that JUNE FRANCIS WILLIAMS aka Mrs Carol Woods of 30 Fell View she with ID as if SHE is me (wherever I “live” the Gestapo arrange for parasites and lowlife to be me –I Ieft Flat 3 on 24/3/14 but appear to move to 28 Fell View at least 5 times every single week; YOU fund all that and seemingly without a murmur). I did not claim on my insurance and WILLIAMS sent to stand about in Lancaster and “be seen” as PROOF she had been me at my insurers wasted her time. (Today she is out again posing as me somewhere; I have ceased to worry about such deluded, deranged thieves.) BUT my car window apparently never happened as it is not my car and I am not me so, how to confuse all that in a NEW version? The Gestapo found a pair of lowlife in a light coloured Y reg Renault and they have a smashed rear window which they have left in that state for at least 3 months now. They are sent to park at 13 Fell View and then drive about and PRETEND that their window was mine and thus I only think my car window was smashed and the photo presumably is manufactured. They have to be driving illegally and my rear window was not the one in question. BUT the Y reg is to make it YK02 VPF and MINE when the lowlife driving (2 unemployed as usual) use 13 to be Flat 3 miles away! Thus on 11, 12 and 13 plus today, that car and blue not used thus far (the police waste time trawling records for idiots who think their use will give them an MI6 role) they found a BLUE L driver car T974 KEC and that was sent to drive round and round Fell View and I was to see and be “brainwashed”. The KEC is used on others when they can be found. I wonder if the pair with the Y reg are not insured so cannot have the repair done. The Gestapo use MANY who they know are not insured. In 2012 I inadvertently recorded my previous car as K71 KEC (a white Polo) when it was K71 CEC. In that the Gestapo found another unemployed to pester at 298 and she with P112 KEC was claiming to be my daughter within a huge DWP fraud – out of scope here. I then realised my error in typing but was leaving 298 anyway; she I guarantee would never have gone to 298 after that. She appeared after LENNON had run away and X486 DDC had “disappeared”. T230 KEC a red VW was a stalker sent to harass in the same “idea” and R945 KEC was used by a yob at 31 Fell View his BLUE car he unemployed claimed for most of 2016 to be me as MR Carol Woods. He then “disappeared”. T reg cars are favoured also as my former sister in law Janet Greenwood of 37 Norfolk Ave Morecambe has been used often to pose as me in fraud and more; her T reg car is BLUE, T193 JEO. The driver of P112 KEC was not the only unemployed to be used at 298 to claim to be my daughter. Ialso attach 2 pages of MY car K71 CEC STOLEN by the Gestapo to wreck it to cover up the ILLEGAL GPS on that car as well which I found out about so my car was stolen by Macadams garage (police garage) hidden miles away and systematically wrecked to hide what they had done to my electrics which is what they have done to MY car now. I have added some hand done notes as they refer to my car “disappearing” from HUBERT PLACE Lancaster where it was parked while I stayed with a daughter not far away. Naturally the lunatics have since decided that the unemployed lowlife they then moved to Hubert Place was my daughter and a partner. ONE they moved was a thief and worse from 298 Oxcliffe Rd in 2013.The pair did not drive. Anyone can ask questions as to all that but all is out of scope here. My insurers reclaimed my car to keep as evidence as they knew crime was involved in tampering. But notice how REAL police do not know much about the disappearance of MY car. Notice how they track the owner ME to MY house which they record as being called GREEN TREES when it was and is CHERRY TREES. Notice it says UP FOR SALE which is part of the FRAUD and EXTORTION as I was said to be bankrupt and my house was stolen wrecked and looted in that. But apparently I made it all up and sold my house as “too disabled” to live there (obese apparently). But in a bankruptcy a house has to be auctioned. Thus we start the FRAUD and more with MY house and how Gestapo thuggery needs to be “rewritten”. BUT notice it also records that there is a STEEL DOOR on MY house and the windows are all covered in such. They were not; MY expensive double glazed windows where ripped out to make sure I could not live in MY house from 27 Oct 2008. They had plastic covering the areas. BUT this is something else I have been said to have MADE UP. What liars and thugs I deal with. And then of course, we have the looting of the dead, police issue false personal ID to fraudsters and looters who claim to be me as a) non-driver and b) such as Williams in 30 Fell View which makes me wonder how I have this formal document obtained when I made my Sec 7 Subject Access Request to the police (which the ICO had to persuade them to deal with). Are they saying MY passport was really Williams’ and they sent me her file which was in my name? Are they saying MY photos and car docs from the time are not really mine but I have burgled her or anyone else who claims to be me? Please remember that in 2011 my then landlady Janice Bournen of 7 NorthWay Lewes claimed to be me and she was a driver. Please ask if you wish to see the Gestapo record of them recording that they ignore ALL I report as I am “anti-police” and “paranoid”. 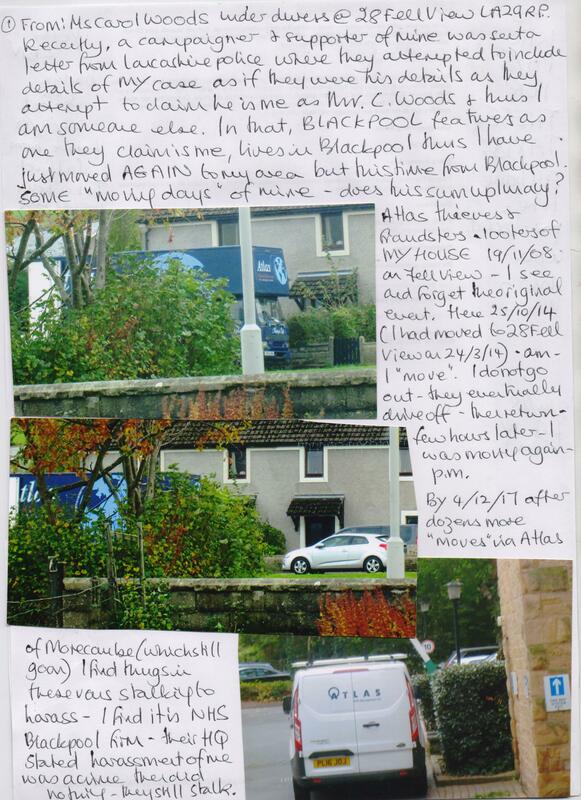 I forward the text from Ms. Carol Woods, of 28 Fell View, Caton, Lancs., LA2 9RP, dated 05 May 2018 concerning various persons living close by Ms. Woods residence who, it is very strongly alleged, by Ms. Woods own reconnassaince, that many, if not all these persons are involved in various types of crime, particularly DWP frauds. As you are aware, it is any UK citizen’s duty to report crime – past, present or potential – to authorities in an effort to keep our society as safe as possible. For some time I’ve known that not only you, but many “authority figures”, including my own local police have been informed of various types of crime that is going on in Lancashire, some very serious, yet nothing seems ever to be done about any of it. Indeed, 2 local police officers visited my home in June last year to discuss the contents of endless emails I had sent the Dorset police Chief Constable at the time – those contents concerning numerous crimes, some very serious, occurring in Lancashire. The officer’s response was that there was nothing she could do except to report what I was telling her – exactly the same as what I’ve told you in this message, and before, coincidentally – to Lancashire police, with a view that Lancs. police would then contact Ms. Woods about the crimes occurring in Lancashire that I know Ms.Woods has much evidence regarding. Of course, no such contact was made by Lancs. police to Ms. Woods – everything regarding the reporting on numerous crimes proved a waste of time, including these officers wasting their time by talking to me when they could have been out doing their jobs. Furthermore, when I contacted “Crimestoppers”, to their credit they did return my contact to them by phoning me, but they then blew all that away by showing their contempt by hanging up the phone halfway though the call, without warning, when trying to report to them exactly what I, and Ms. Woods have reported to you already. I know Ms. Woods has given you concise and clear examples of crime committed, as I have, referring to just one example – I forwarded details of to you regarding the Oxcliffe Rd. Morecombe habitees and frequenters who were clearly breaking the law around 2012, as Ms. Woods witnessed, when one character or more even went so far as trying to murder Ms. Woods by attempting to blow up the caravan she was resident in via gas leaks created by them. 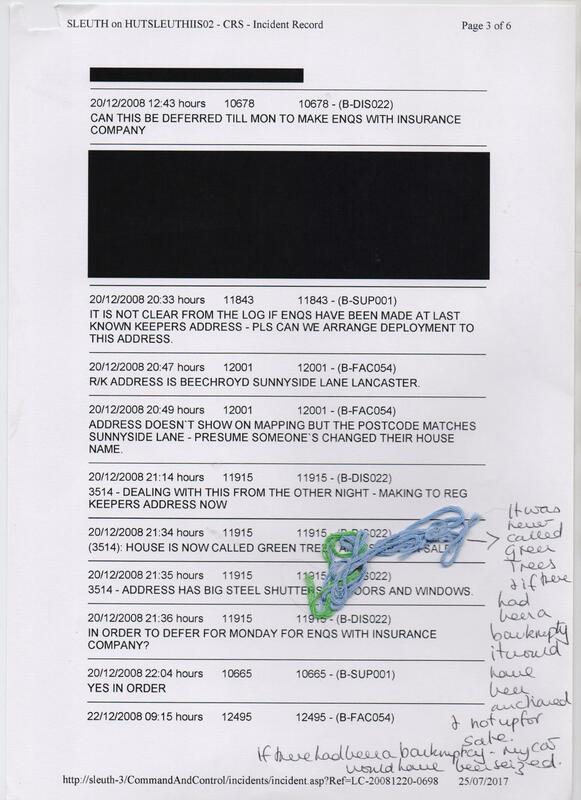 Bearing all this in mind, as well as Ms. Woods latest notes shown below in her text from 05 May 2018 which details more frauds and fraudsters, can you please tell me how these characters named throughout the communications to you detailing DWP crimes alone are left to continue committing crimes when notifications of crimes committed are left seemingly uninvestigated throughout – not only by yourself, but by many other law enforcement personnel? Of course you can’t speak for anyone other than yourself, but why are crimes still being committed when you have been notified of criminal activity and the person’s names responsible for such aren’t apprehended or brought to book in any way? I’m sure many people would be interested to hear why these people are left to commit crime and drain the public purse by their nefarious actions in many ways and aren’t stopped from doing such when people such as yourself – a fraud investigator – are told exactly who they are and what they are doing? Please supply the answer to my question.